In Super Smash Bros. 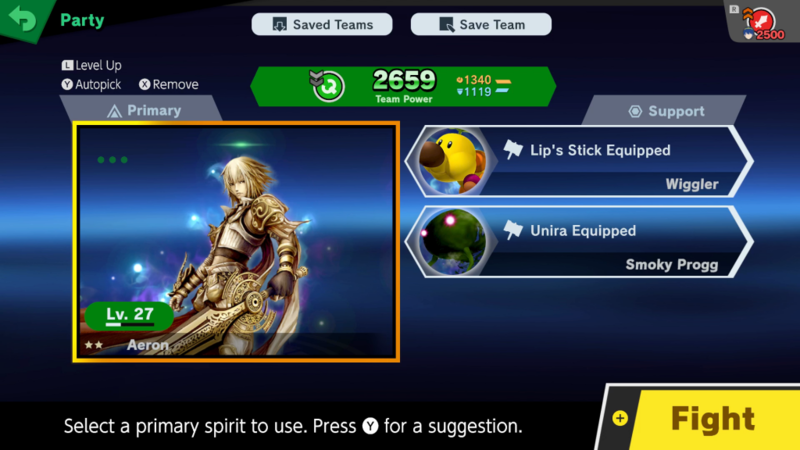 Ultimate, Spirits are a brand new addition to the franchise, and make up a large part of the collectibles in the game. But unlike the trophies of previous titles in the series, Spirits actually serve more of a purpose whilst playing as when used they can add a series of bonuses and buffs to your fighter which might just give you the edge in the heat of battle. But initially Spirits can be quite overwhelming, as there’s a lot to get your head around to really get the most out of them. So check out our useful guide below on how they work. If you’re struggling to unlock characters, check out our handy guide to do just that, here. Spirits are everywhere in the game, but usually serve as a reward in certain modes. 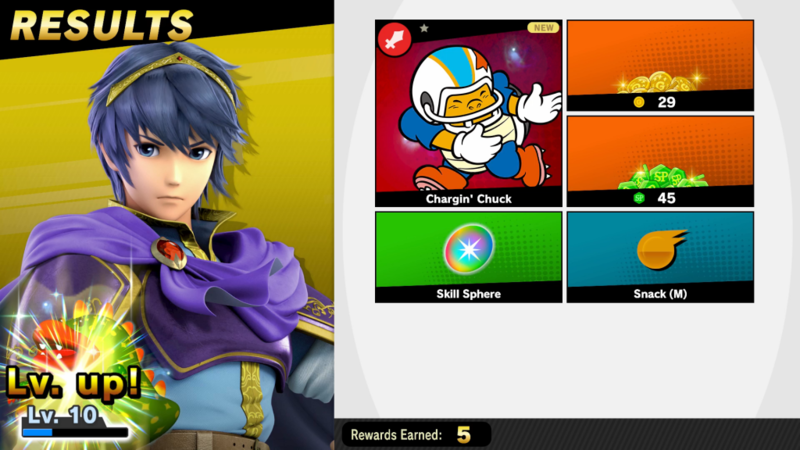 As such you might find if you complete a Classic mode with a character you will unlock a Spirit then for example. 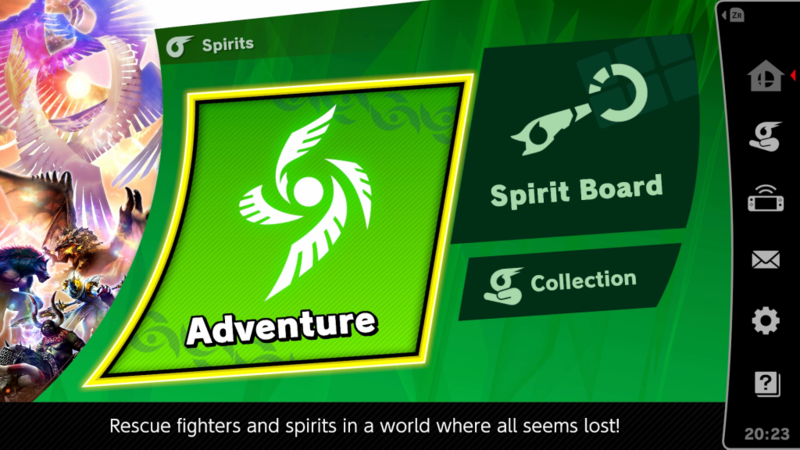 However the main place to access Spirits quickly is in the Spirits menu, which will give you access to the World of Light adventure mode and Spirit Board sections. There’s also a Collection section here where you can view your current Spirits at your leisure. 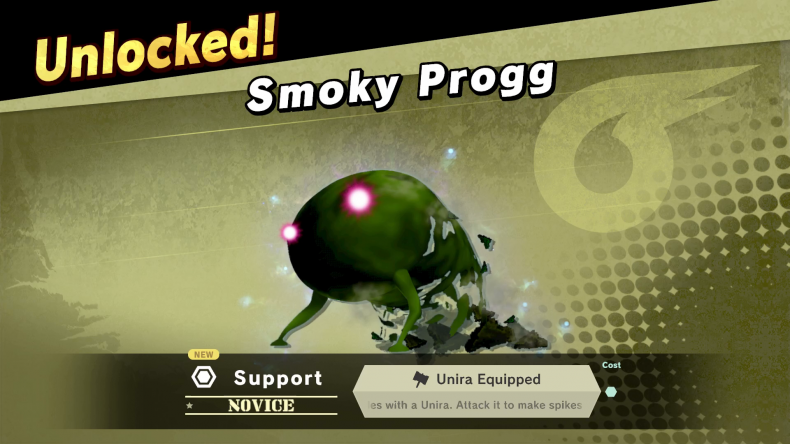 It’s important to remember that there are two different types of spirit that you can find in Super Smash Bros. Ultimate – Primary Spirits and Support Spirits. Primary Spirits are the main spirit that gets attached to your chosen fighter, and gives you a boost to both attack and defence. Each Primary Spirit will also come with up to three slots available to attach Support Spirits to. 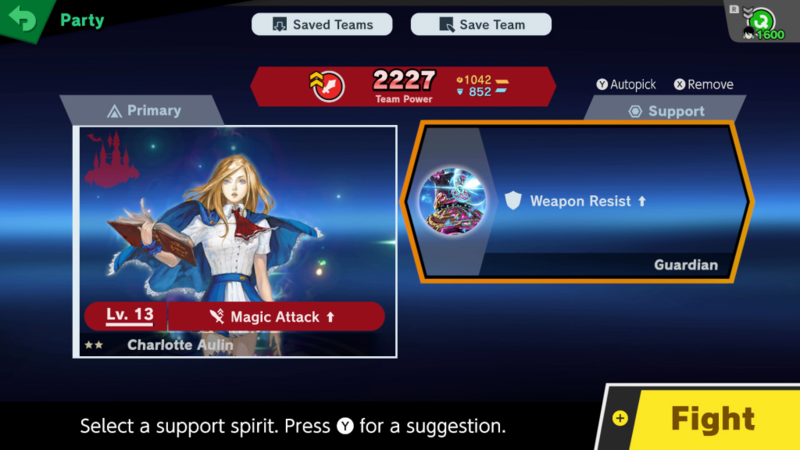 Support Spirits provide a unique bonus, such as a free starting item for your character, resistance to particular damage or higher damage output on certain types of attacks. When you unlock a spirit, it’s worth looking at whether it is a Primary or Support Spirit to understand how it could help you moving forward. Rarity of your spirits is also measured in terms of stars, the more stars it has, the higher boost to attack and defence a Primary Spirit gives you, and the rarer, more valuable bonuses a Support Spirit has. Why Spirits become so important, particularly in World of Light mode, is because they help you become stronger over time. This happens because your Primary Spirits can gain experience and level up. By having a Spirit equipped during a fight, it will gain experience when the bout is over. How much experience it gains will depend on its current level, the difficulty of the enemy you faced, and crucially if you won or lost the battle. Primary Spirits do gain a little experience even if you lose, but the reward for victory is significantly higher. When you receive your rewards after a bout, check the bottom left hand corner to see your Primary Spirit gain experience and hopefully level up. As they level up, the boost of attack and defence that they give your character increases, making future battles easier. You can also use Snack items and Gym locations in World of Light mode to improve your Primary Spirit level without fighting. Snacks are a consumable which bestow a lump sum of experience on a Spirit, whereas the Gym will see you Spirits game experience over time whilst you are battling with other Spirits equipped. To add another layer of complexity to proceedings, every Primary Spirit will be one of four different Primary types. 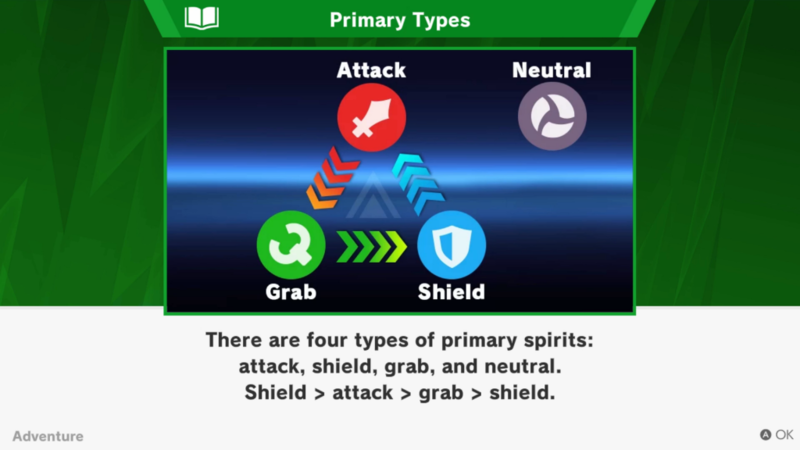 The different types are Attack, Grab, Shield and Neutral. Neutral has no real strengths and weaknesses versus the other three, but otherwise there’s a Rock, Paper, Scissors format going on, whereby each type has the upper hand against one of the other types. Before any fight, you can always change up your Spirits, so if you’re coming up against a Primary Spirit enemy that is either Attack, Grab or Shield, it is advisable to pick a Primary Spirit from the type that is strong against your new foe. By doing this you’ll do more damage and receive less in the fight, giving you an easier time. Obviously if you do the reverse, the opposite is true, and your fight will become significantly harder. As such it’s a good idea to pay attention to your enemy’s Primary Type. Now you know a lot about the various mechanics of Spirits, it’s about putting that all together to make decisions when facing more difficult battles. The last thing to consider in battles is how strong you are overall compared to the enemy you are about to face. This is denoted by your Team Power, which will be mainly driven by the attack and defence stats of your Primary, but also any bonuses coming from your Support Spirits. If this number is in line with your enemy’s Power (shown in the top right of the screen before the battle) then the fight should be comfortable. A large gap to the enemy’s Power will make the fight difficult, but not necessarily impossible. So it’s worth picking not only the right Primary Type but also one that is of a reasonable Power to tackle the upcoming enemy. Also worth remembering is that sometimes the bonuses of the Support Spirits can be critical to your success in certain fights. If you’re facing a metal enemy for example, and you have a Support Spirit to that increases your damage to metal enemies, you’ll find things easier. Also if the stage has a threat such as fog, poison or a lava floor, be sure to equip Spirits that negate that effect if you have them just so you have one less thing to worry about during the frantic action. You also have the option to save up to 99 different teams should you find a particular set up that works for you, with a given fighter, so feel free to experiment! 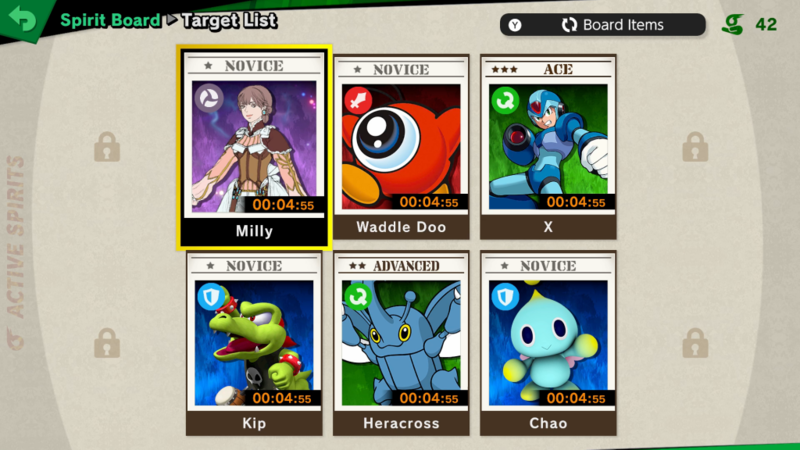 Lastly, Spirit Board can give you quick access to a lot of Spirits to help bulk out your collection, but it comes with a few caveats that are worth remembering. The biggest one is that you only get one chance to beat each Spirit in this mode, and if you lose it is gone, so make sure that the loadout you choose gives you the best chance of success. The Spirits will swap out as time passes, and so your list will refresh in real time. It’s also clear here what rarity of Spirits you will be battling, but just note that rarer Spirits will have higher Power, and so will need a stronger team to overcome. Should you be victorious, that’s not the end though, as there is one more test to overcome to bag your new Spirit. You need to shoot the spirit with a laser gun to release it from its master, but there is a barrier protecting it that rotates with only a small gap, requiring precision timing to get right. Success rewards you with the spirit but failure means your gun hits the shield, shattering a part of it, meaning an easier time the next occasion you try and nab it. There is the option to pay for the privilege of a second shot of the gun, but only once. You can also use items you have in your collection to slow the spin of the shield or widen the gap of the shield to give yourself an easier time freeing the Spirit. Hopefully this guide means you now understand a bit more about Spirits and can set off and start collecting them and using them to your advantage. Happy Smashing!